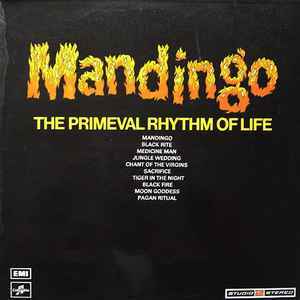 Tumbas, bongos, guiro, cueca, claves, conga drums, cow bell, bass drums, marimba, xylophone, boo-bams, timbales, african squeeze drum, temple block, tambourine, chinese gong, tubular bells, bell tree, glockenspiel, cabasa, maracas, percussion, tuned percussion, jawbone, piccolo, bassoon, soprano saxophone, baritone saxophone, horns, tuba, celli, pianoforte, organ, electric piano, electric hapsichord, electric guitar, acoustic guitar, bass guitar, synthesizer. A quest for modern man finding his roots seeking the missing link of his origins . Massive tribal percussive mix with jazz rock funk and heavy brass section .